Tuesday July 14 1908 We were busy with the morning work. We girls all went down at 2.12. Nellie got of at the bridge. Ida & I were at Dr Smiths office. I got some things for the table. I came home at 5.39 did evening work. to bed early. 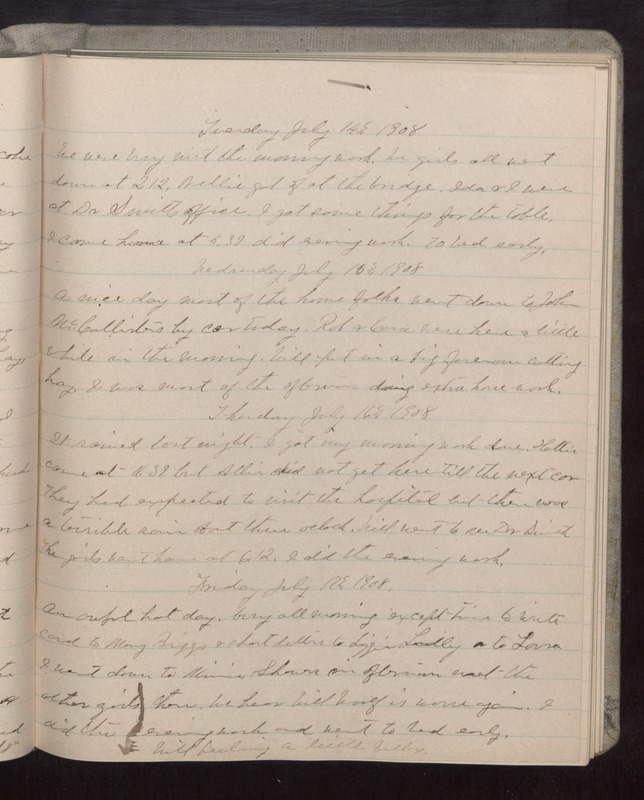 Wednesday July 15 1908 A nice day most of the home folks went down to John McCallisters by car today. Rob & Cora were here a little while in the morning. Will put in a big forenoon cutting hay. I was most of the afternoon doing extra house work. Thursday July 16 1908 It rained last night. I got my morning work done. Hattie came at 11.39 but [Allie?] did not get here till the next car They had expected to visit the hospital but there was a terrible rain about three oclock. Will went to see Dr Smith The girls went home at 6.12. I did the evening work. Friday July 17 1908 An awful hot day. busy all morning except time to write card to Mary Briggs & short letters to Lizzie Lindley & to Lorna I went down to Minnie [Shaws?] in afternoon met the other girls there. We hear Will Woolf in worse again. I did the evening work and went to bed early. Will feeling a little better.